Your choices and options for building a 4 link suspension include a broad selec­tion of control arm joints, tubing and tubing adapters, brackets for the frame and axle, coil­over shocks or tradi­tional coil springs and shocks, bump stops and limit straps, and an assortment of mount­ing tabs and housing bridges. Whether you're building a custom system or improving an off-the-shelf system, you'll be able to build a high performance suspension for your vehicle with parts and components available from Foothill. Approaching your system design involves many parameters — the basic system (four link, four link with track bar, three link), suspension travel requirements, vehicle height and weight, wheelbase, traction considerations (squat/antisquat) — all of which factor into the components you will need and how they will be assembled and installed. Foothill's broad selection of components and parts will result in the exact suspension you seek to build. Actual design of suspension systems can be involved — entire books have been published on the topic. However, there are a few critical parameters to factor into your design that will result in a system that performs well. Look for a tutorial from Foothill at a future date. Selecting the appropriate control arm joint is critical to building a correct suspension. The joint must flex and rotate on the desired axes and in the desired planes. Certain joints can also be used to limit motion in undesired directions, but they can't be stressed beyond the design limits of the joint without damage to it. 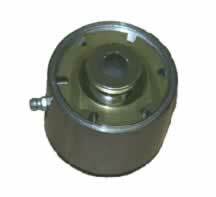 Ride quality, noise, and transmission of vibration also factor into joint selection. 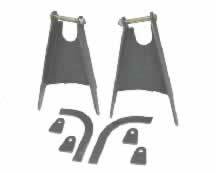 Because there is a broad spectrum of needs, Foothill Offroad has developed a wide selection of joints to choose from. These types of joints are commonly found on factory systems and many aftermarket suspensions. They provide a quiet ride and excellent handling characteristics but are prone to quick wear or failure when asked to flex at high angles. They are a good choice for a joint where motion control on a single axis is desired, such as a control arm that pivots around the bolt only and doesn't twist side to side. 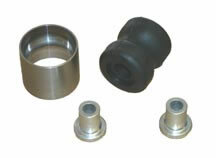 Flex Ball Joints, commonly known as “Johnny Joints”, have a ball assembly that rides in poly races inside a steel collar. They are a rebuildable and serviceable joint that works quite well in many systems. Side loading can be an issue with joints that use snap rings to secure the ball and races — they can be forced out under extreme pressure. For this reason, Foothill's joints use only one snap ring and when installed correctly (opposing one another on each arm) they will help one another with side load forces. Flex ball joints typically can rotate about 20 degrees, making them quite suitable for most suspension systems. 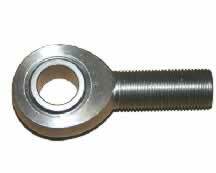 They are available in two sizes and either as weld on or thread in components. Heim joints are popular and found in many applications — control arms, track bars, steering, end links, and antiwrap controls to name a few. They are available in a wide range of designs — steel on steel, Teflon lined, hardened housings, and left or right hand thread. Heim joints are a ball and socket design that offers rotation approaching 30 degrees. For greater rotation, high misalignment spacers can extend that rotation, at the expense of mounting bolt diameter. As a relatively hard joint, they quite easily transmit noise and vibration, making them somewhat annoying on rough surfaces at high speeds. Control arm tubing choices fall into two camps — heavy duty, thick wall tubing that can take the abuse of punishing rockcrawling use, or lightweight thinner wall tubing where weight is a consideration. Foothill can supply either style of tubing for a variety of applications. Weld-in tubing adapters facilitate the construction of control arms, or thick wall tubing may be directly threaded for accepting a joint. For lower control arms in “long arm” systems, 2″ diameter, .250 wall DOM tubing is a common choice. It is difficult to bend, albeit a bit on the heavy side. Arms can be built with any of the larger joints described above and the appropriate tubing adapter. For track bars, upper arms, and lower arms that don't see harsh use (sand is a good example), chromalloy tubing is a good selection. Tubing measuring 1.25″ diameter, .120 wall thickness, has the same strength as thicker wall tubing but it is less resistant to impact. It's light weight but high strength make it a good material when weight is a consideration. 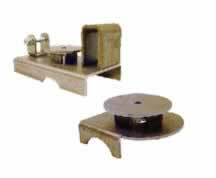 Joints and adapters are available for large and small sizes. Whether you're building a short or long arm suspension, triangulated 4-link or 4-link with track bar, with coil springs and shocks or coilover shocks, there are a variety of components available. Many can be used in multiple ways, offering greater flexibility in designing your system. Choices include lower arm brackets, upper arm brackets, track bar brackets, and housing bridges. Lower brackets are sized for the larger joints above, with spacer sleeves and misalignment spacers for narrower joints. Upper brackets are similar in design for joints up to 2″ wide. All brackets are laser cut and formed. Housing bridges span the differential housing and are welded to the tubes on either side, providing locations for mounting brackets or tabs, limit straps or bump stops. For coilover shock designs, Foothill has a selection of tabs and brackets for axles, and bracket kits for use on the frame. They accept all major brands of coilover shocks and springs. For traditional coil spring and shock systems, two approaches have been developed. For front axle applications, the rectangular seat provides a mount point for a coil spring, shock mount, and track bar mount. The coil spring seat can be located where necessary to achieve the desired effective spring rate. For rear axles, a rounded, foreshortened seat ensures adequate clearance of arm mounts and shock mounts. 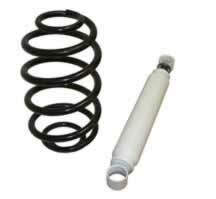 Springs and shocks can be divided into two categories. First is the traditional coil spring setup with standard shock absorbers. As off the shelf components, they are cost effective solutions that can provide excellent performance. The choices however, are limited to “what you see is what you get”. You're limited by what manufacturers have to offer for spring rates, lengths and diameters, and shocks have fixed or moderately adjustable valving. 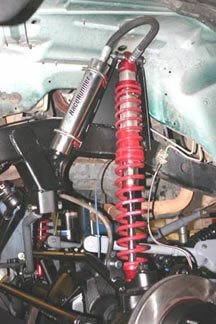 Suspension travel in these systems is typically limited by the length of the shock used. The second choice is a coilover shock design. These designs offer seemingly infinite combinations of spring rates and lengths and shock construction and valving. While somewhat expensive, it is possible to tune a suspension minutely and if desired, to the specific needs of each corner of the vehicle. These components are also rebuildable. Coilover shocks have longer travel than traditional shocks but also require additional mounting space. Four link suspensions have the inherent capability to allow damage to occur to drivetrain and suspension components. Without some control, it is quite possible to damage driveshafts, steering rod ends, shocks or brackets. Bump stops should be used at critical locations where damage might occur. A variety of choices are available, ranging from air bump stops to competition style poly bump stops to hard, fixed point button style stops. Over extension of a suspension can result in the same damage — be sure to use limit straps in the appropriate locations. Sway bars are used to control body roll. On the highway, they provide stability when cornering or traveling on rough roads. Off road, they provide control of body roll on side hills, but at the expense of suspension travel. Two fundamental solutions to sway control have appeared. First is the factory sway bar that can be disconnected. This traditionally has been handled with removable end links that permits the sway bar to be swung up, out of the way, and secured. It is a simple, easy way to gain suspension travel. The downside is the difficulty in reconnecting the sway bar. Foothill has disconnects in several lengths for this style of sway bar. For newer Jeeps, Foothill recommends the Tera Street/Trail sway bar system. It features a stiffer torsion bar for better on road handling, yet is easily disconnected with a single turn of a knob. To re-&sly;engage the sway bar, simply twist the knob to the street setting and drive away. It will automatically lock itself. A common pitfall that suspension builders encounter is selection of springs that are too soft, thus mandating a sway bar to maintain some control, even when traveling offroad. 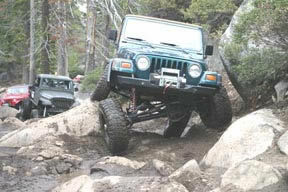 If the suspension has been designed correctly, then a sway bar on the trail shouldn't be necessary. The second solution is a permanently connected sway bar. These are a compromise, in that there will be reasonable highway behavior, but there will also be some limitation of suspension travel on the trail. To help with tuning the ride and providing some choice of sway control, the torsion arms typically have several holes for locating the end links. Moving the end links will change the leverage exerted, thus changing the amount of sway control. The biggest convenience with this sway bar design is that there is no work involved to disconnect or reconnect the sway bar.